For those of you who didn't catch my guest post on Be Creative Mommy, we talked a little about our Exceptional Blogging series. In our last post about building an Exceptional Blog, we talked about the importance of eye-catching photos. One way to do this is by creating collages or story boards. It's your blog, so tell us your story! Collages are not only appealing to the eye, but they help break down some of the "clutter" an over abundance of photos can create in a single post. Sometimes you get lucky, and of those 76 photos you took, a good 20 came out stunning. Of course you want to show off as much of your hard work as possible. Why wouldn't you? You invested your time and effort into capturing great photos. 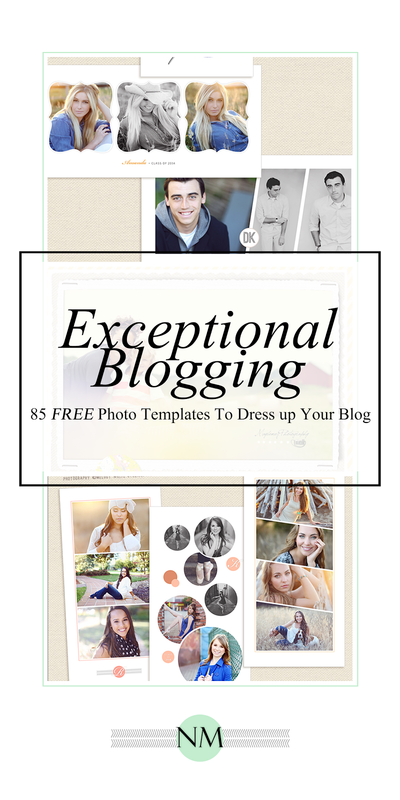 Show off as many of them as possible with photo templates. I did some of the hard work for you and rounded up 85 FREE blog boards for you to begin telling your stories in various eclectic ways. Each of the attached links are PSD (Photoshop) files. If you read through our original post on Exceptional Blogging, you'll see we talked about investing in your blog and investing in Photoshop. It's not daunting, I promise! You can even follow along with me on the blog and read up on our Photoshop tutorials. I would be happy to share a tutorial, showing you how to do use these. All it takes is the knowledge of layers and clipping masks.